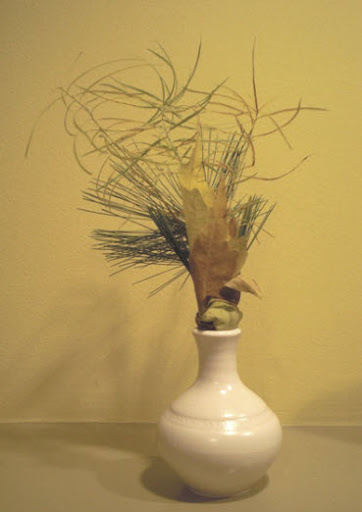 Let's just say that ikebana -- or kado, the way of the flower -- is something I'd like to pursue more deeply, beyond the paper I'm writing for my Inner Awareness class. 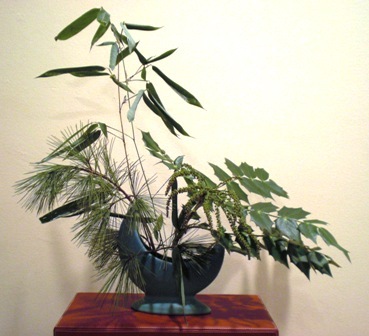 This is an attempt to echo the traditional New Year's arrangement, which would normally consist of bamboo, pine, and budding or just barely flowering plum -- three materials that have special significance in the dead of winter. Having no plum, I found that my mahonia had started to put out buds in wonderful cascades. Even though the greens are different textures, they're all roughly the same shade, which makes the composition a bit monotonous. I can see how plum blossoms would really make a difference. I love having a class where I can play with plants as part of the process of writing a paper.